Rhea's social mission is to combat homelessness and deliver a product that will help change the way the world houses its people. Starting at US$ 2 per day, Chototel provides a dignified, affordable accommodation solution to those affected by the global housing crisis. What inspired you to create Chototel? The demand for affordable housing became clear to me while working in the housing and hospitality industries in India. In India, 28% of urban households are substandard, a percentage rivaled by only that of China globally. While the concept of affordable housing in India is picking up, it is largely targeted towards middle-income families who have the capability to own a home, which forms just 2% of the population. 97% percent of the population is still categorized as poor, and are unable to access mainstream housing facilities due to lack of regular income, credibility, and ability to cough-up rental deposits. This is when I decided to create Chototel – formed from the words “chotu”, meaning small in both Hindi and Japanese, and “hotel” – with the mission to provide a good quality, affordable housing solution in a market that is failing to provide for those at the bottom of the pyramid. The concept of the super-budget hotel, positioned between social renting and affordable housing, as an ideal solution to this shortage came directly from my experience working in both the affordable housing and hotel sectors. What enables you to offer rooms at such low rates? Chototel is different from existing budget hotels for two reasons. Firstly, we are a super-budget hotel. Unlike existing budget hotels, with a nightly rate on average of US$30-50, Chototel’s rates will start at just US$2 a night. Secondly, the way we achieve this low cost is different to existing budget hotels. The traditional budget sector is priced more as a function of its investment cost, which means that the hotels are built in subprime areas with lower real estate costs. In comparison, Chototel is using technology at every level to improve efficiency and ensure we can provide clean, affordable housing at an unparalleled price point. Firstly, we use an innovative construction method – dry steel-frame construction– to build inexpensively and keep working capital cycles short. Next, we have incorporated IoT (Internet of things) technology into the hotel operations to automate many tasks that previously relied upon the staff. Technology is used to manage billing, utility usage and check-in and out facilities, amongst other services. Additionally, our innovative off-grid closed-loop utility system will ensure that electricity, gas, and water are generated on site from natural resources and recycled waste. Technology enables us to minimize and in some cases eliminate costs across construction, management and maintenance. 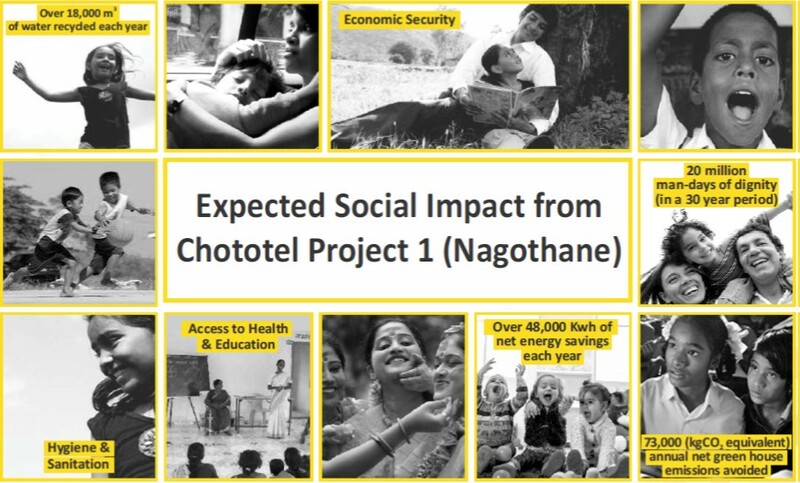 Interestingly, Chototel hotels have two sources of income: the rent – which starts at $2 a night and can surge to a maximum of $5 – and income generated from utilities, such as sales of electricity, water, gas, and services – such as the crèche and community kitchen. The income generated from the rent will be directly waterfalled to investors. And, the income generated from the utilities and services will be reserved to pay for the maintenance, contingency and wages of the hotel. Why did you choose to be a London-based business? We had a choice between various cities across the globe, but we chose to be in London because the social and impact investment sectors are well established in London. A growing number of people are recognizing that it’s important to do social good and impact the lives of people. I read recently that ‘‘the definition of a billionaire is not someone who has a billion dollars, but is able to affect the lives of a billion people’’. Moreover, London is a hub for investment capital. We are an asset heavy business and we would need to raise significant capital to build these hotels. Therefore, we need to be in a jurisdiction where investors trust the legal system. In large parts of the world, one can be stuck in litigation for a long time. There’s also the Real Estate Investment Trust (REIT) regime, which is well established in the UK. What are the pain points of operating in the property market? The key route to success for any property project is access to capital and it is very difficult for SMEs like us to access the funding market. For Chototel, this might be more acute because being an asset heavy business our working capital requirements are higher compared to other businesses pitching for investments. Our model puts us in catch 22 situation where we are too small for institutional investors and too large for retail investors. It is very important for us to find the right target investors who are able to see the value in our proposition. What are the three factors that you think will influence investments in Chototel? What are your expansion plans for Chototel? Our pilot projects in India are almost ready to take off. We also see opportunities to replicate the Chototel model in Dubai and in Bristol, UK. How would you propose to bridge the London housing market gaps? Housing poverty exists in different forms in different parts of the world. We may not see as many homeless people in London but we do see young professionals spending 50-70 percent of their income on rents which is not acceptable. This will inevitably stop attracting great talent to the city. We need to ensure that we bring down that cost and increase the supply of housing. I think the current need is 50,000 homes a year! When we bring Chototel to London we see ourselves retro-fitting a lot of old warehouses, offices, schools etc. and converting them to Chototels at significantly lower costs. Following discussions with many local councils and housing corporations, we have discovered that a lot of their land is not being used efficiently. They are supplying at a very low pace and a high cost. Chototel will use the land which is not being used today at all and create assets that can generate value for the economy and wider society.